Mercury starts the month as a magnitude 0.0 evening object, visible from southern and equatorial latitudes and setting up to 2 hours after sunset. The fast moving planet then draws rapidly back to the Sun until inferior conjunction is reached on December 13th. On the previous day, Mercury reaches perihelion at 0.307 AU (approx. 45.9 million kilometres or 28.5 million miles). During the 3rd week of the month, Mercury re-appears in the pre-dawn sky for observers at northern locations. The planet brightens quickly and by months end will have reached magnitude -0.3. It will be well placed in the sky, just before sunrise. The long morning apparition of Venus finally comes to an end in December. At the start of the month the planet remains a brilliant magnitude -3.9 object, low down above the eastern horizon just before dawn. However, it's not long before Venus is lost to the glare of the Sun. For those at southern latitudes, the planet will only be visible at the very beginning of December although observers at northern temperate latitudes should be able to spot it for a few days more. Mars remains a morning object towards the east before sunrise. The planet starts the month in Virgo just 3 degrees north of slightly brighter star, Spica (α Vir - mag. +1.0). From northern latitudes, Mars rises about 4 hours before the Sun, although considerably less for those located further south. As the month progresses, the planet improves in magnitude from +1.7 to +1.5 with its angular size increasing from 4.2 to 4.8 arc seconds. However, this is still too small to telescopically make out any significant surface details. On December 13th, the waning crescent Moon passes 4 degrees north of Mars. The planet then crosses into Libra on December 21st. At the end of the year, much brighter Jupiter (mag. -1.7) will be nearby. Jupiter is a morning object in Libra. The dominant planet in the Solar System rises some 2 hours before the Sun on December 1st, improving to up to nearly 4 hours by months end. Its magnitude increases from -1.7 to -1.8 and its apparent diameter from 31.4 to 33.0 arc seconds as the month progresses. On December 7th, asteroid Vesta (mag. +7.9) passes 4 degrees north of Jupiter. Later on the 14th, the waning crescent Moon also passes 4 degrees north of Jupiter. 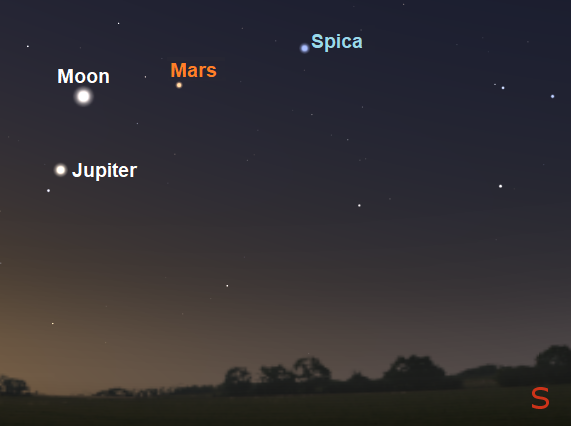 As previously mentioned, Mars and Jupiter are close together towards month's end, although the "Red planet" is 3 magnitudes fainter than its giant neighbour. Saturn reaches solar conjunction on December 21st. As a result, it won't be visible this month from northern temperate latitudes. From southern latitudes, the planet (mag. +0.6) may be glimpsed during the first few days of the month, low down above the southwestern horizon just after sunset. Brighter Mercury is a few degrees nearby at the start of the month. Uranus, mag. +5.8, continues to move slowly retrograde. 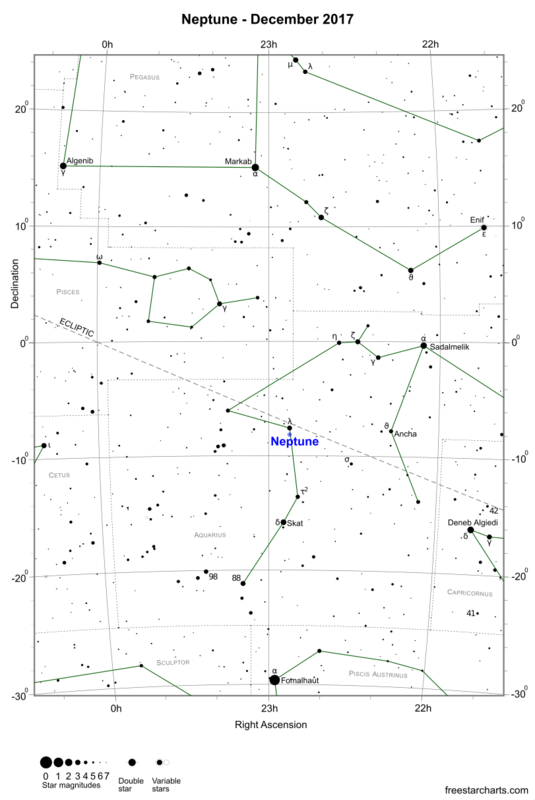 The distance ice giant is two months past opposition but remains well placed for observation in the evening sky in Pisces. During December, it's visible as soon as it's dark enough, remaining so until after midnight. 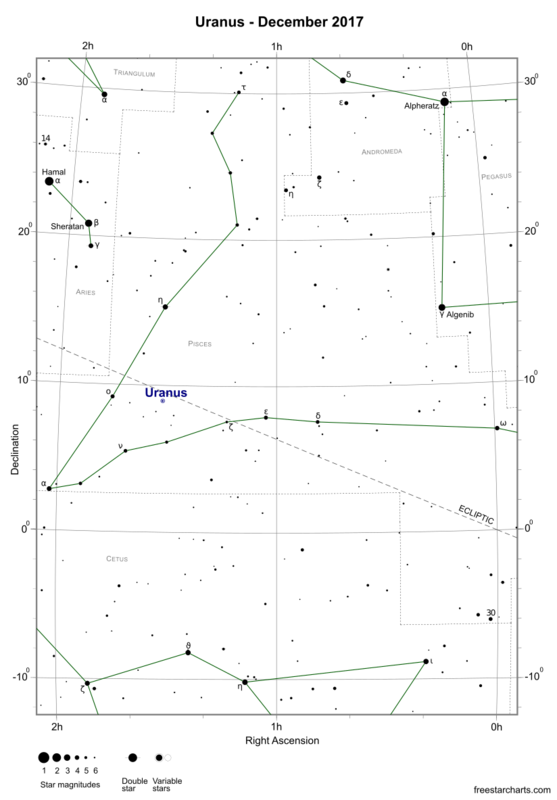 Uranus is faintly visible to the naked eye and very easy to spot with binoculars and small telescopes. A small 80mm (3.1-inch) refractor at high magnifications shows a small greenish disk, 3.7 arc seconds in diameter. On December 27th, the waxing gibbous Moon passes 4.5 degrees south of Uranus. Neptune, mag. +7.9, is moving direct in Aquarius and a few degrees from the Pisces constellation border. The most distant planet in the Solar System can be seen with binoculars and small telescopes for a few hours towards the west after dark. It’s currently positioned about 30 degrees southwest of the centre of the Great Square of Pegasus and just south of lambda Aqr (λ Aqr - mag. +3.7). On December 24th, the waxing crescent Moon passes 1.4 degrees south of Neptune.